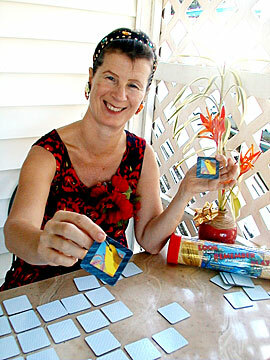 Hilo resident Gerdine Markus adapted a memory card game to a Hawaii motif. Players turn over a card, then try to remember where they saw the matching card. The matched pairs earn points. IN GERDINE MARKUS' native Holland, board games are among the most popular dining-table activities, and adult memory games are easy to find. "They have beautiful memory games with various themes," she said, with topics ranging from golf, to the capitals of Europe, to painters, such as Monet. "It's a great way to educate on a specific topic." When she moved to Hawaii, Markus searched local toy stores but couldn't find a memory game challenging enough for adults. So she created her own, using clippings from local airline magazines. Markus made 10 prototypes and played the game with family and friends. 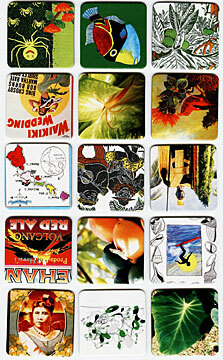 Soon she was collecting her own images and works by local artists with the aim of putting her board game on the market. A few years later, Look, Remember, Play is in stores. The game includes 120 cards stacked neatly in a clear cylinder, held in place with red crinkle paper that represents hot lava. Markus moved to Hilo from Long Island about 15 years ago. "I saw the lava flow into the ocean and fell in love," she said. Since then she has immersed herself in the culture. As president of the Outdoor Circle, she helped save an area in historic downtown Hilo from becoming a parking lot. The site now houses Liholiho Gardens, with 23 native Hawaiian plants. She wanted her game to be a worthy representation of Hawaiian life and culture. Animals, birds, plants, the state seal, hula, beaches, rainbows and even shave ice are in the mix of cards. Most of the cards are explained in a booklet that accompanies the game. The game won the "Keep It Hawaii" Certificate of Merit from the Hawaii Tourism Authority in July. Kaliko Beamer-Trapp, who works at Hale Kuamo'o Hawaiian Language Center and teaches Hawaiian language at the Hilo Community School for Adults, reviewed the game for authenticity. "It was very well done," he said. "We want to promote the proper use of Hawaiian language, including spelling. It is easy to be complacent." He said he enjoyed the diversity of the cards included in the game. "It was a good mix. She didn't go overboard trying to make everything Hawaiian. She had a broad range of items ... things of today as well as things from the past." ALTHOUGH THE game was created with the adult in mind, it can be modified for all ages, Markus said. "You can choose cards and limit the amount used depending on the child's age and attention span." Players can engage in a simple matching game, like Concentration, where each player flips over a card and then tries to find the match. Alternatives to make the game more challenging include variations in which players must call out the names of the pictures in order to capture a matched pair. Teachers have tried game out in their classroom, not just for play, but also to teach Hawaiian names for objects and what islands they come from. "The game can be used as an educational tool to develop awareness and appreciation of their culture and immediate environment," said Jean Acevedo, a teacher on the Big Island. "They can see what the islands have to offer, and they can learn Hawaiian words." Plant and marine life are highlighted on the cards, reinforcing scientific concepts, she added. "The images are beautiful -- a creative combo of photographs and art." Deloris Guttman, a teacher at the Hawaii Multi-Cultural Learning Center on Oahu, has her students discuss the pictures and later write stories based on the images. "It is another way to get children to relax and play while learning. It also introduces them to Hawaiian history." Markus herself has a teaching background -- she opened a music school for children when she first moved to the islands. The Pacific Academy of Music has a faculty of six and teaches piano, recorder, voice and violin, mostly to children ages 3 and up, using the Suzuki Method. "I love to work with young children," she said. GERMAINE HAILI, floor manager at Native Books, said the game sold well during the holidays. The store's owner was introduced to the game at Hilo's Merrie Monarch Festival, she said. "We brought it in because it is one if its kind." The memory game is available at nearly 50 locations statewide. Oahu locations include Iolani Palace, Bishop Museum, Education Works at Dole Cannery and the University of Hawaii-Manoa bookstore. "I wanted the game to be appealing to both tourists and the people who live here," Markus said. "Visitors who take the game home are given the opportunity to extend and enrich their time in Hawaii and share their experiences with others. Kamaaina "can benefit, too -- sharpening their memory skills while enjoying wonderful pictures of their home." » On the Net: For information about Gerdine Markus, visit www.thealohaexpress.com or www.pacificacademyofmusic.com.